The mission of Custer County Search and Rescue, Inc. (CCSAR) is the search, rescue, and/or recovery of a person or persons who have become lost, incapacitated, or deceased in Custer County, Colorado. 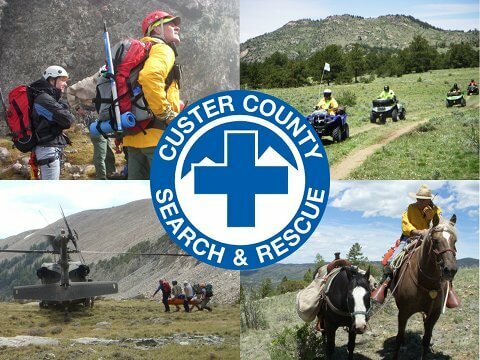 Custer County Search and Rescue (CCSAR) is a 501(c) (3) organization providing search, rescue and recovery of persons who have become lost, incapacitated, or deceased in Custer County, Colorado. SAR services are provided free of charge, under the supervision of the Custer County Sheriff and in support of nearby counties and jurisdictions. It is through the generous support of the community that CCSAR is able to acquire and maintain their off-road vehicles, technical equipment and the specialized training necessary to uphold their mission. CCSAR responds to backcountry calls, including a high volume of calls in the South Colony area, encompassing Humboldt, Crestone Needle and Crestone Peaks, as well as the many trails and summits in the Sangre de Cristo Wilderness area, the Wet Mountains and the Music Pass area in the eastern portion of the Great Sand Dunes Park Preserve. Annually, CCSAR has seen their mission numbers increase. Many now involve medical trauma requiring air-evacuation, or the recovery of deceased persons in complex terrain. Four such complex and high profile missions involving military and air-ambulance assets in the Crestone Group occurred this past summer alone. All members are volunteers who dedicate their services to train and respond missions year round.